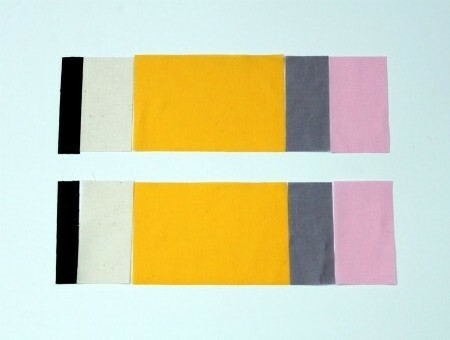 Black - 1.25" x 3.5"
Cream - 1.75" x 3.5"
Yellow - 6" x 3.5"
Gray - 1.5" x 3.5"
Pink - 2" x 3.5"
Lining - 10.25" x 3.5"
Fusible Fleece - 10.25" x 3.5"
Sew these pieces together using a 1/4" seam allowance. Do this for both sets of "pencil" pieces. When done, press the seams open on the back. 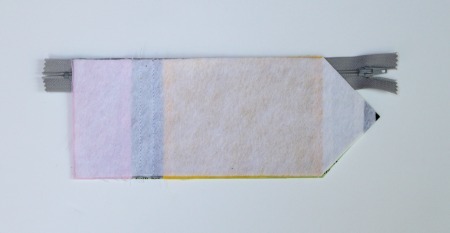 Step 3: Apply your fusible fleece to the wrong side of each "pencil" piece from Step 2 following the manufacturer's directions. Step 4: You'll need to mark where you want the point of your pencil. Measure down 1.75" from the top edge of your "pencil" and make a mark on the outside edge of the black fabric. 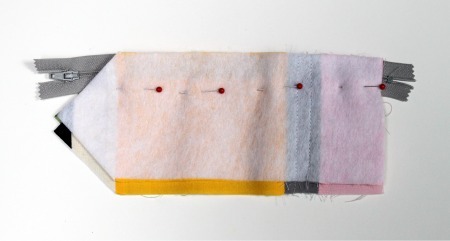 Line up your ruler from this point to the point on the bottom of the "pencil" where the cream fabric meets the yellow fabric. Cut along this line. Repeat on the opposite edge to create your point. Step 5: Repeat Step 4 for your second "pencil" piece. Step 6: Add some topstitching to the gray fabric to make it look more like the little metal band around your pencil. I added two equally spaced rows to each of the "pencil" pieces. 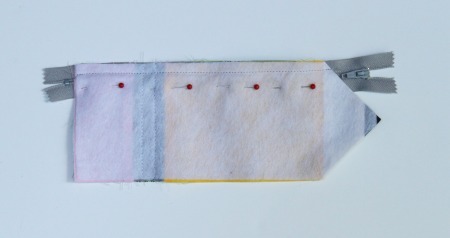 Step 7: Next, you need to cut the pencil point on your lining fabric. 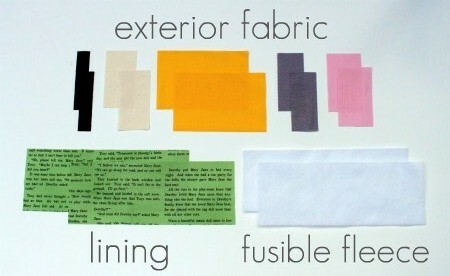 Make sure that you cut the lining pieces in opposite directions if you are using fabric with a pattern on it. I used my "pencil" pieces as a template for cutting the angles on my lining pieces. Step 8: Time to start assembling your pouch. Take one lining piece and lay it down right side up. 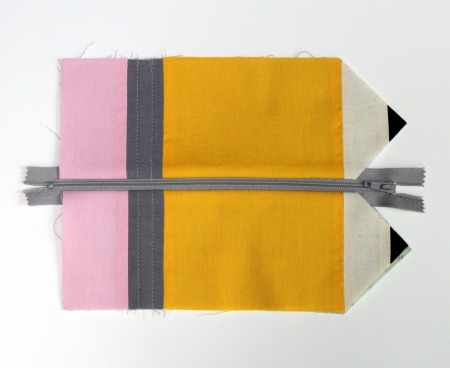 Now set your zipper on top, lining up the top edge of your zipper with the top edge of your lining fabric. Center the zipper horizontally along the top straight edge of your lining fabric (since the zipper won't be attached to the angled portion). 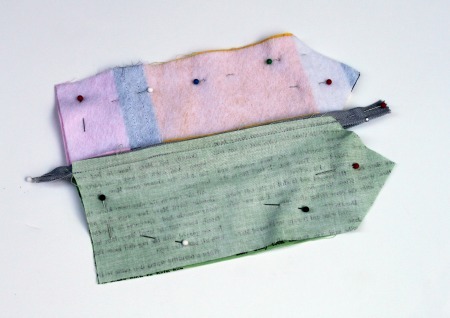 Take one of your "pencil" pieces, and lay it right side down (fleece up) on top of the lining/zipper. 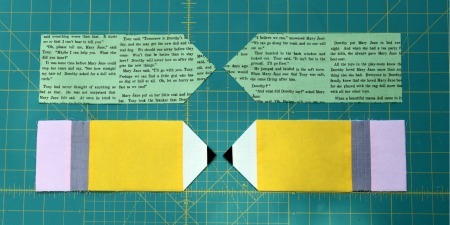 Make sure the edges of the "pencil" piece line up with the edges of the lining. 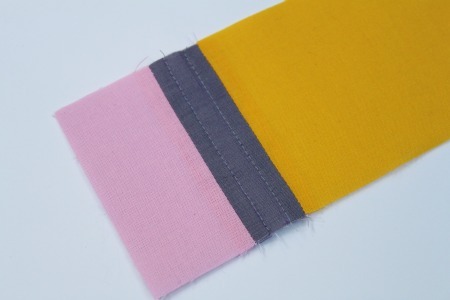 Pin all of the layers together, and sew along the top edge using a zipper foot. 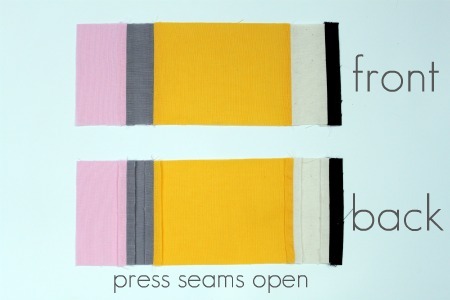 Pull all of the layers to one side of the zipper and press, being careful not to set the iron on the zipper teeth. Step 9: Take your other lining piece and lay it down right side up. 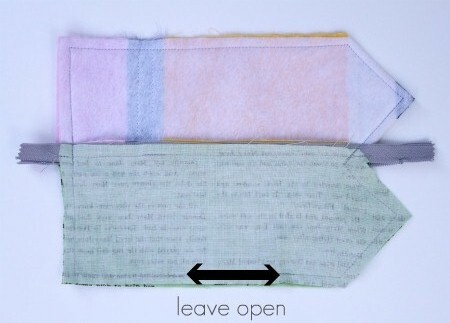 Now set your zipper on top, lining up the top edge of your zipper with the top edge of your lining fabric. Make sure that the left and right edges of all the layers line up. 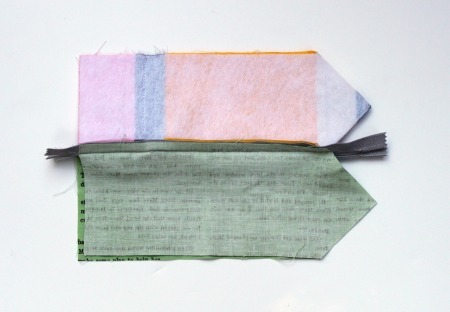 Take your other "pencil" piece and lay it on top of all your other pieces right side down (fleece up), lining up the top edge with the top edge of your zipper. Make sure that the left and right edges of all the layers line up. Pin all of the layers together. Sew along the top edge using a zipper foot. Unzip your zipper to about 2" from the end. 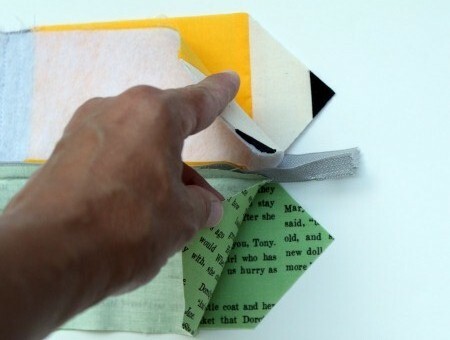 Take your lining pieces and bring them together, right sides facing. 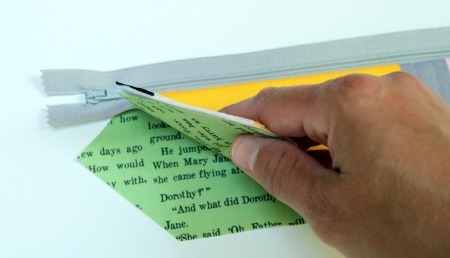 Take your "pencil" pieces and bring them together, right sides facing. 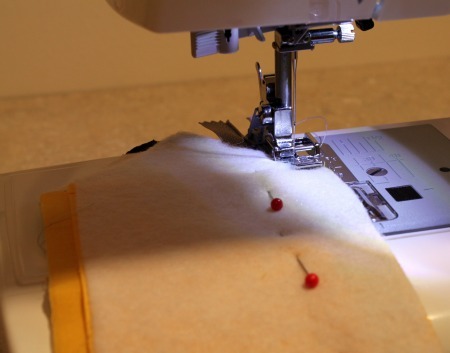 Pin together, making sure that the teeth of your zipper are pointed toward the lining. Sew all the way around using a 1/4" seam allowance and leaving a 2" opening along the bottom of the lining. Go over the zipper a couple of times to reinforce it. Step 11: Clip your corners, and cut off the excess zipper on either side (even with the edges of the fabric). Turn the pouch right side out through the opening in the lining. Press. Sew the opening in the lining closed, and tuck the lining into the pouch. Press again. 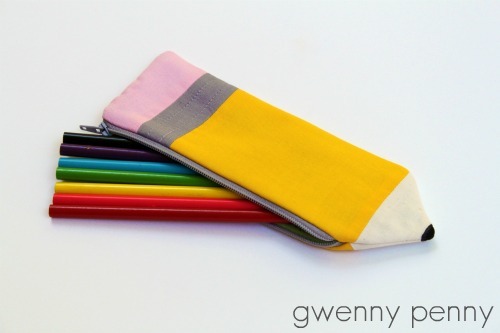 You now have a cute pencil pouch, perfect for back to school! 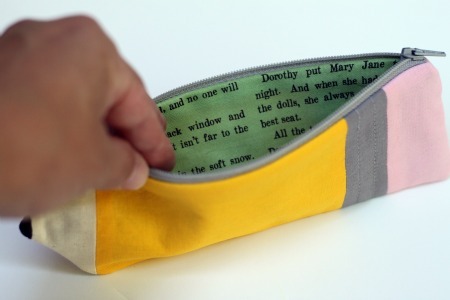 You can also personalize your pencil pouch by adding a name, initials, embellishments. Try hand stamping, embroidery, applique. Lots of options. And it doesn't hurt that this pouch goes together pretty quickly, too. Have fun with it! Updated 7/28/2014: A Limited Commercial License is now available for this tutorial. If you have a home sewing business and purchase this license, you are entitled to make and sell these pouches for profit. 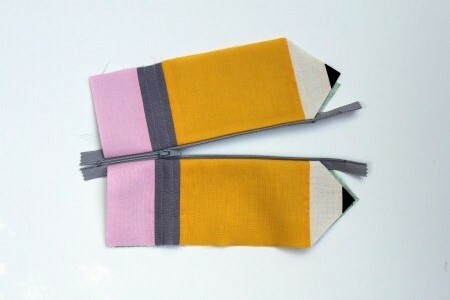 The license is good for as many pencil pouches as you are capable of making by hand, and all items must be handmade by the purchaser. Factory or mass production is strictly prohibited. The fee for the license is $10. I am asking sellers to agree to follow a few specific guidelines. If you are interested, please read the complete terms and conditions, found HERE. Thank you. I love it!! 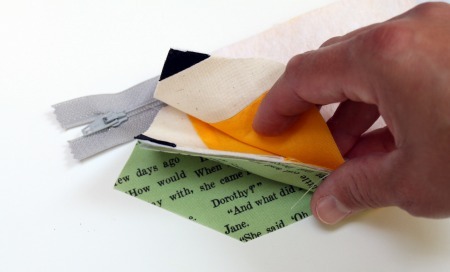 What a cute project, and so perfect for back to school. Thanks for sharing such a great tutorial with us! This is darling Gwen! I LOVE it!! I LOVE the pencil case!!! Thanks for the great tutorial. How cute are you, Gwen! What a great idea. Turned out so cute. I LOVE this Gwen! Leave it to you to think of something uber cute like this. :) Such a great idea! This is too cute! I love it!!! IN LOVE with this one! Love love love. Beautiful I'm one to make one. By the way where did you get the lining fabric that has letters? I can never find one like that.Thank you!! Oh my adorable! I love it. And I want one for myself even though I have nowhere to take my pencils anymore :) It would be so fun to use a freezer paper stencil to add the student's name (or mine...) -- great projects and a great tutorial, Gwen! Gwen, this is so cute! I love it! I'm going to pin this now. Found you on One Pretty Thing, by the way, and I'm so glad I did! Thank you for sharing your nice idea and your fine tutorial! Gwen you rock! That is just a genius idea for a pencil case. And it looks so great too! Way to go man! I adore this!! I will make one this weekend! oh my word I am DYING of cute! So in love with this! forget kids I want this for myself! Adorable! So clever and cute! I don't carry a backpack to school any more but I still love an adorable pencil pouch. Your idea is right on the mark! I love it!! Adorable. I am for sure going to make some of these for the grandkids. Absolutely love this! Thanks for sharing the well-written tutorial. Thanks for this great project! Made one for a girl who will be sudent teaching next year. I had to make the fleece/lining 10.75 inches (I think) - not sure if I cut something wrong though! Awesome job - thanks for sharing. O mY! the penciLs cases are the most cLever thing i have ever, ever seen! i LOVE the little darLings and i can't thank you enough for the awesome tutoriaL! You are my H e R O ! Estupendo tutorial. Gracias por compartirlo. Brilliant idea!!! Kids would love it. I hope you don't mind, but I'm pinning this. This is the cutest little pencil case I have ever seen! Thank you so much for sharing it. Adorable pouch! Thanks so much for the great tutorial! Wow! 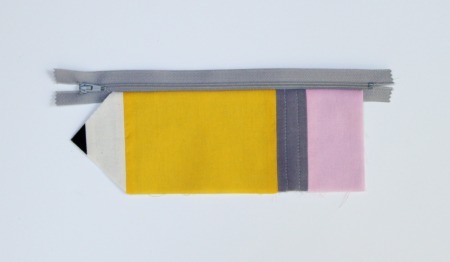 Adorable zippered pouch with the BEST tutorial I've ever found for one. Thanks so much for your amazing and thorough photos and explanations. My granddaughter will love this. :-) Hugs! This is soooooo amazing!!!! I can't wait to make one!! !